Sweldong Pinoy is a salary calculator for Filipinos in computing net pay, withholding taxes and contributions to SSS, PhilHealth and PAG-IBIG. To use the app, you may check the web app at http://sweldongpinoy.com, install the Android app or download the Chrome Web Store App. As of now, it is only available on the web and using your Android devices. If you have devices running on other platforms, you may access the app using http://sweldongpinoy.com. We'll inform you if we will have other app to release in the other platforms. We are still improving and updating the app. If you want to help, send us comments or suggestions. 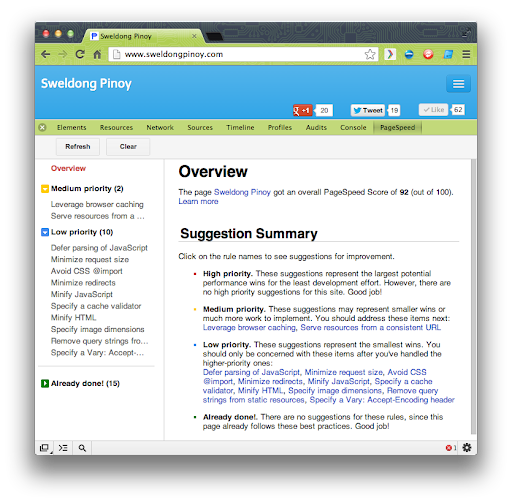 Sweldong Pinoy got an overall PageSpeed Score of 92 out of 100; and there are no high priority suggestions! There are still some areas to improve though. I'm hoping to increase the PageSpeed Score in the next few days.